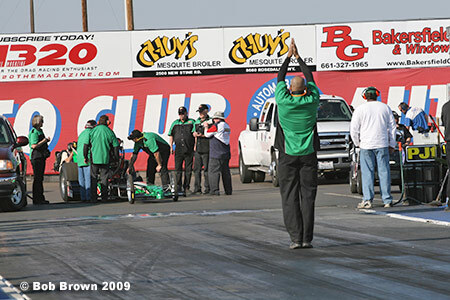 Bakersfield, CA - March 06-08, 2009: Jim Murphy has been on a mission for the last five years and that is to win an unprecedented 5th March Meet. 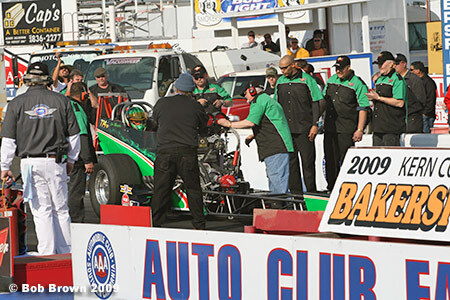 His last MM win was in 2004 and since then he has come close three times - including this year - but even a new car could not get the WW2 Racing team in the winners circle at the 2009 edition. 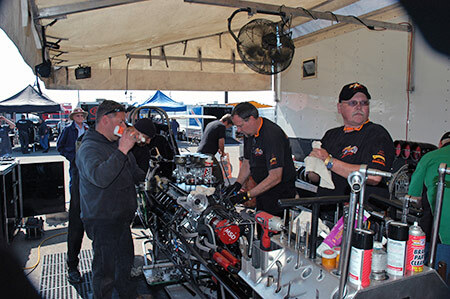 Although Murphy was pleased with the overall performance of the new car it was ultimately an aggressive tune-up that ended the weekend just one round shy of a shot at another win. 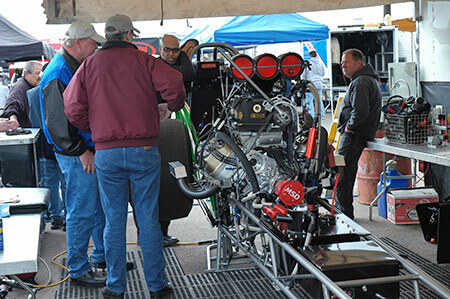 With the first qualifying session not scheduled until 2:00 p.m. Friday was pretty low key in the AM. 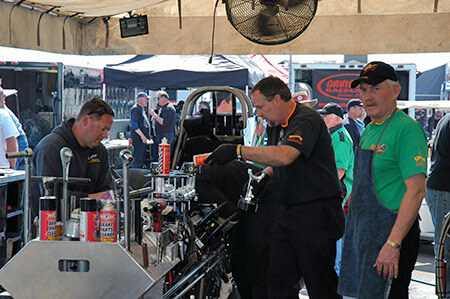 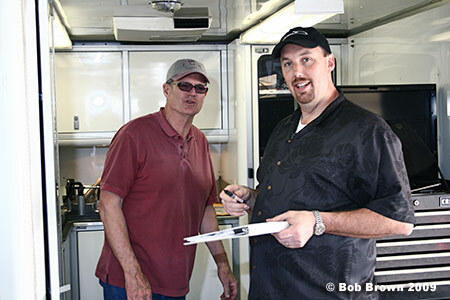 Jim Murphy spent some time with NHRA Pro Director Dan Olson who had a weekend off from the Big Show. 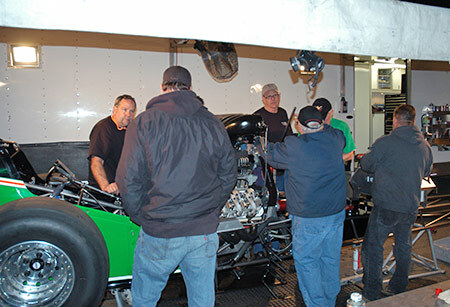 First of three sessions: Friday, 2:13 p.m. 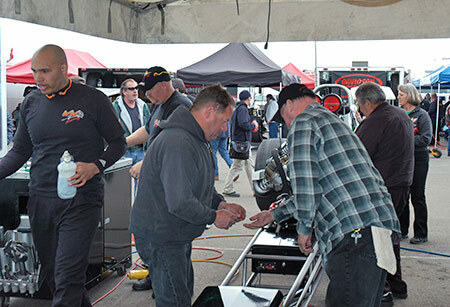 Under cool, cloudy skies the call went out from starter Bill Condit to 'Fire the first pair', and the pro side of the 51st March Meet was underway. 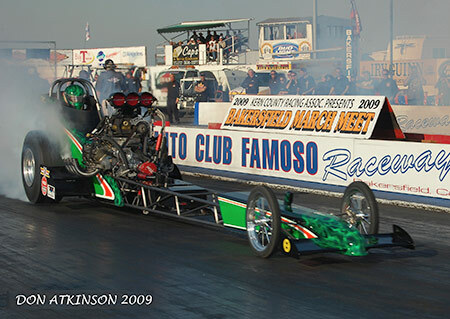 However, it was apparent early on that following a week of rain and cold weather, the normally tight Famoso track was not ready for the 3000 HP fuel cars. 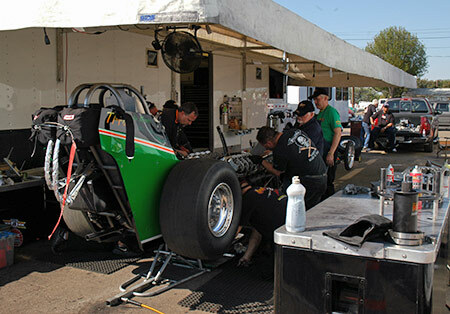 Low track temp and lack of rubber made for an interesting first session. 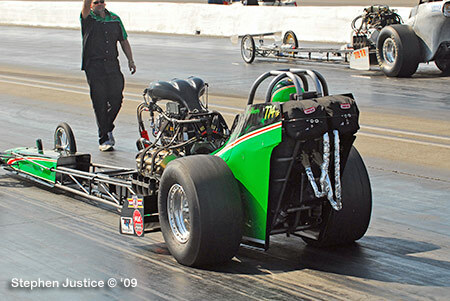 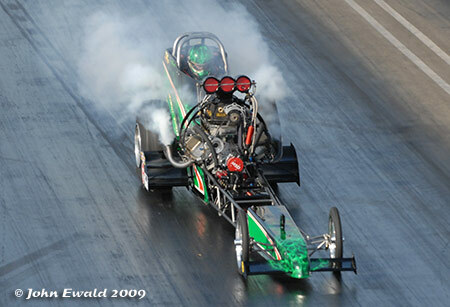 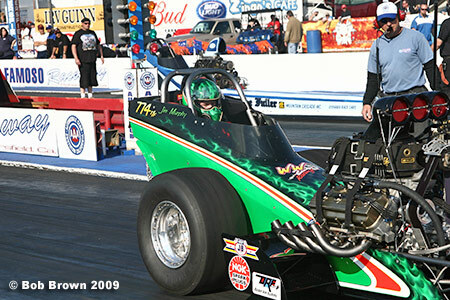 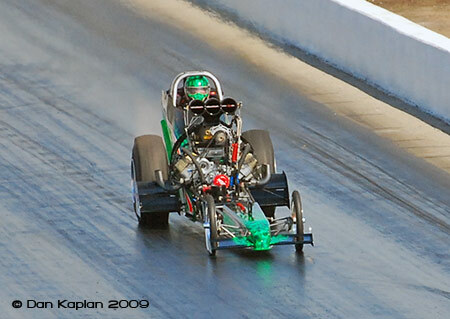 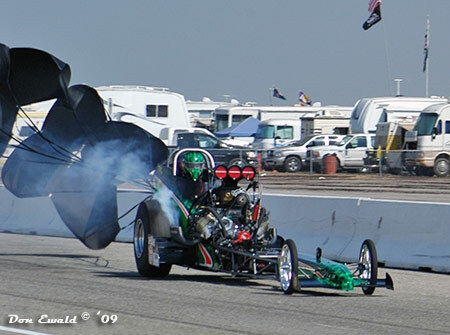 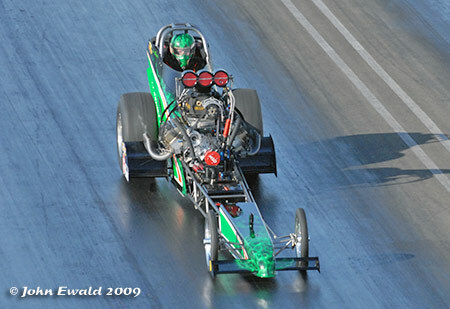 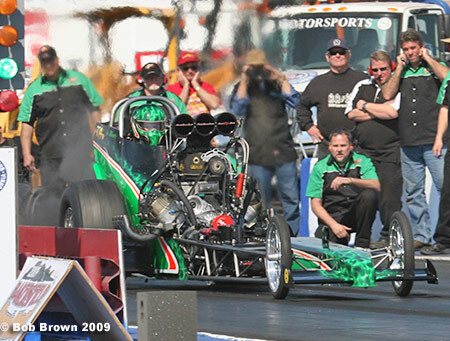 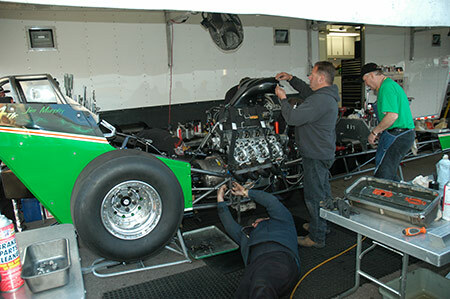 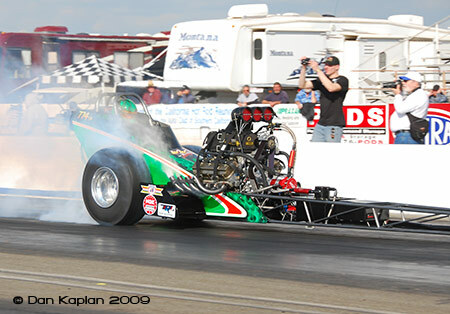 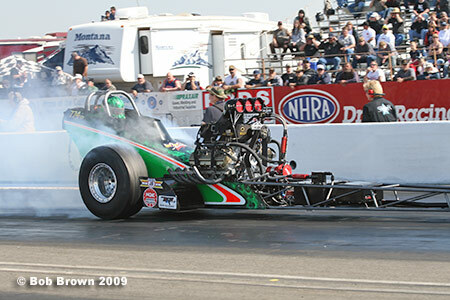 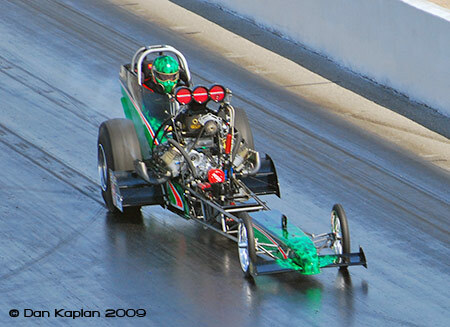 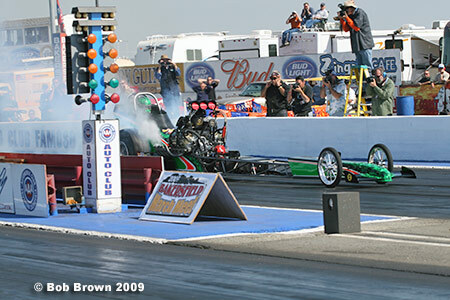 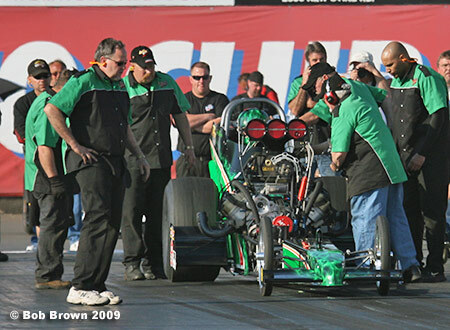 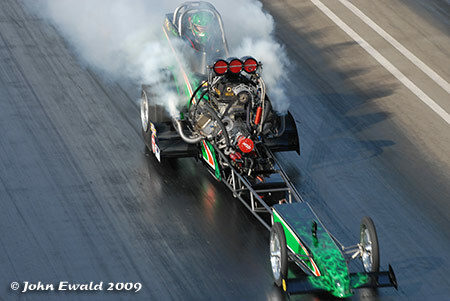 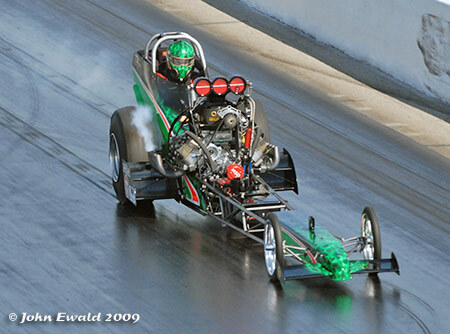 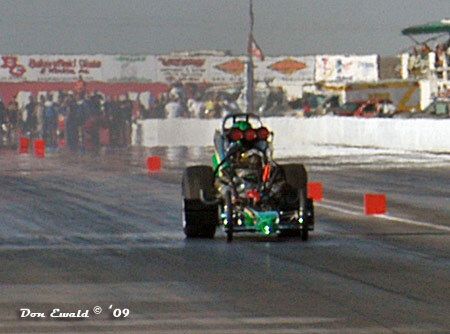 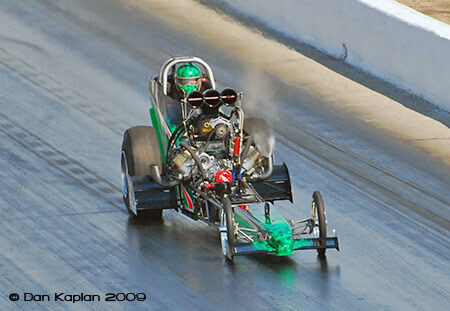 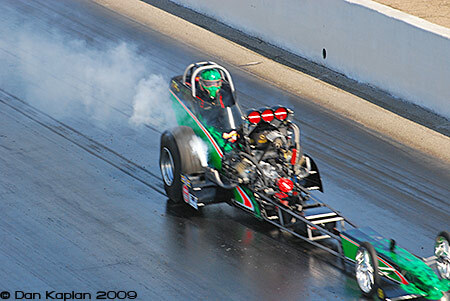 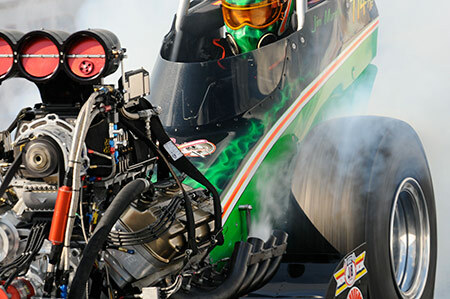 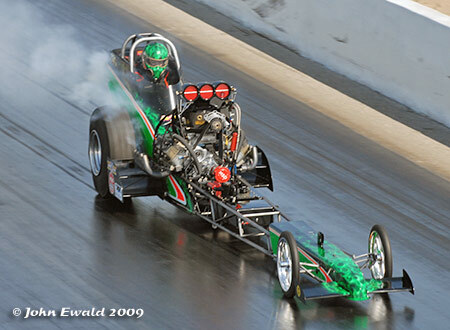 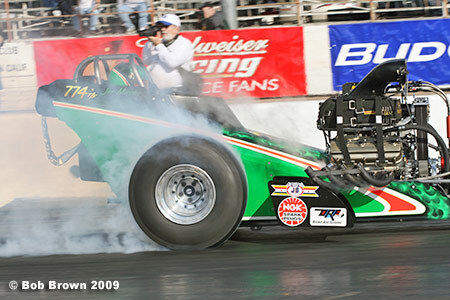 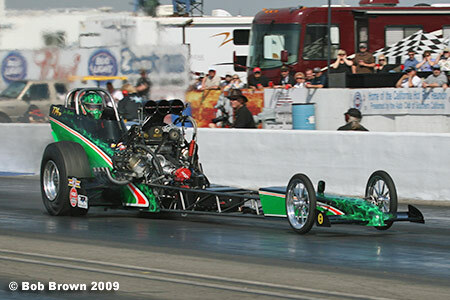 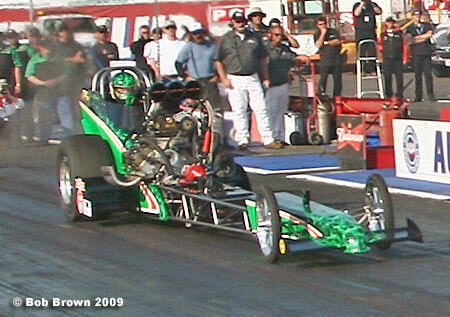 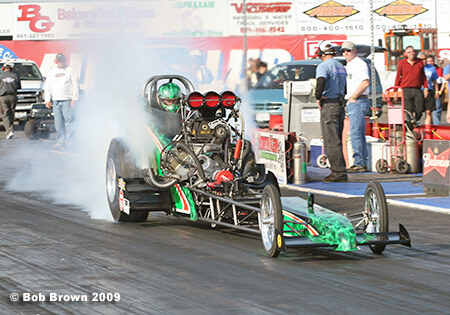 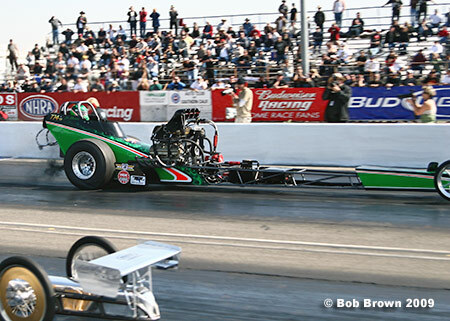 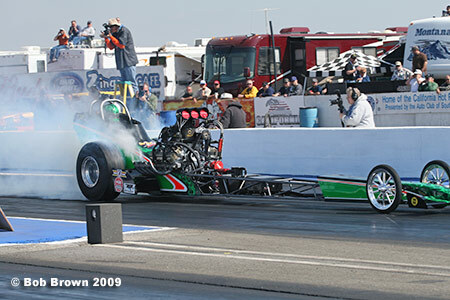 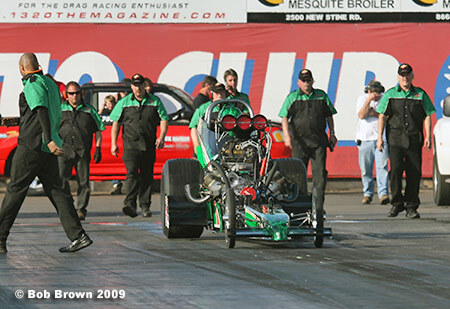 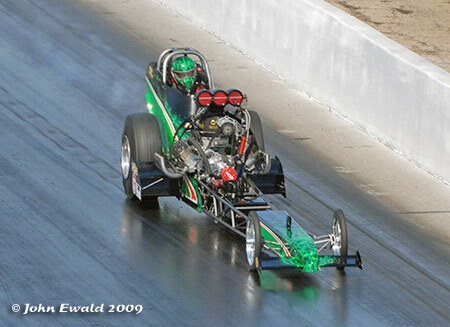 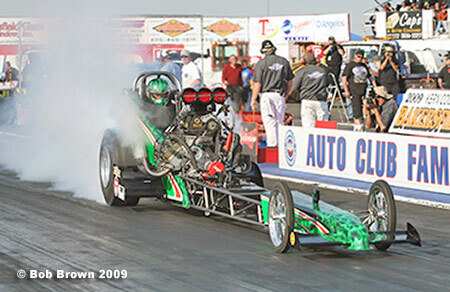 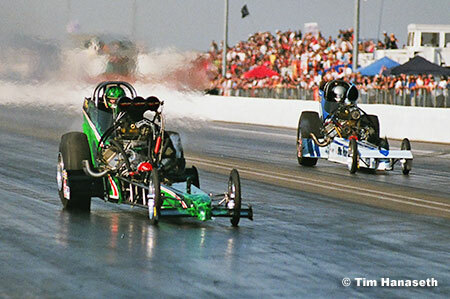 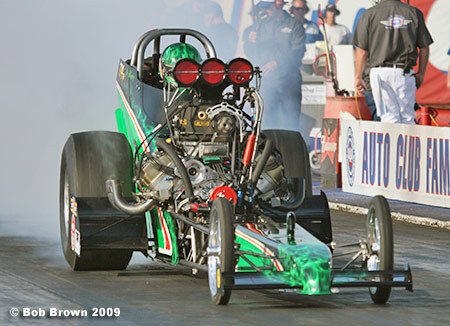 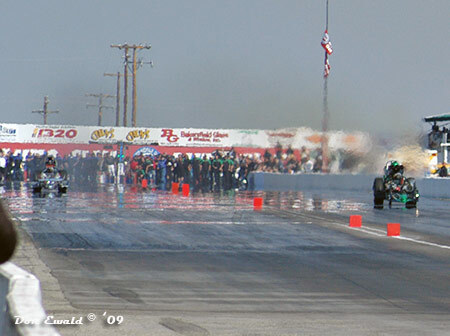 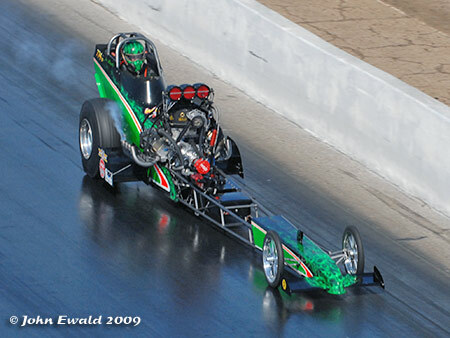 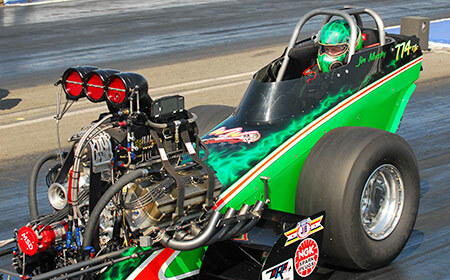 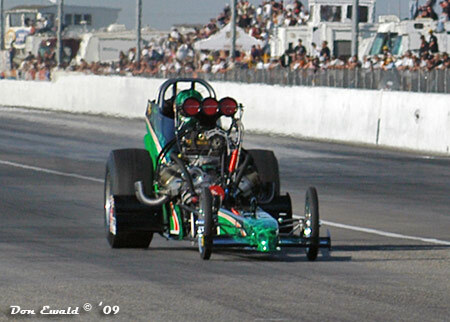 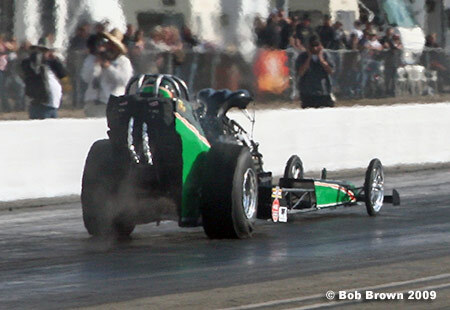 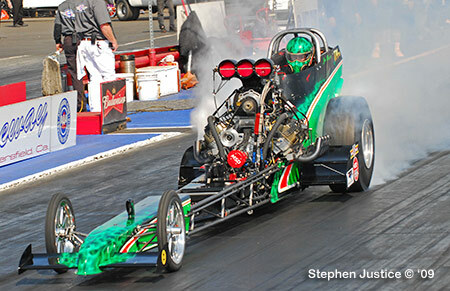 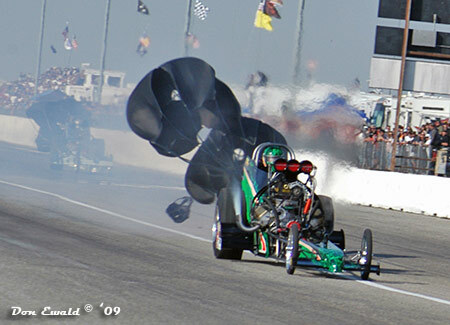 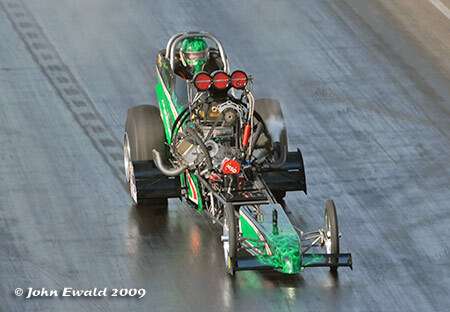 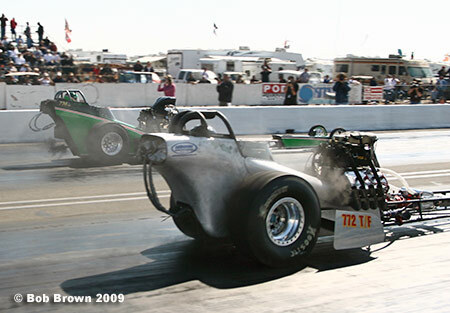 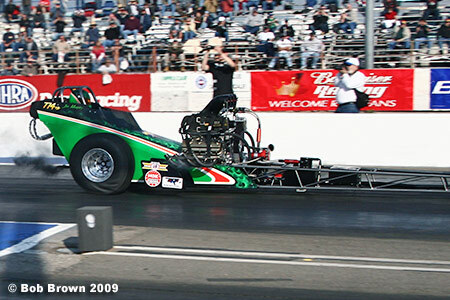 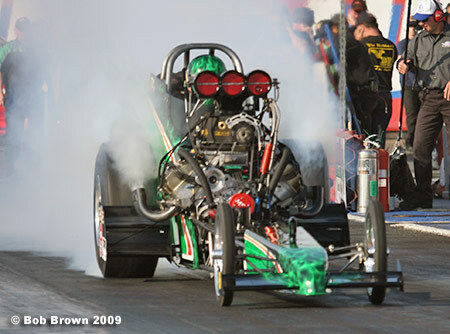 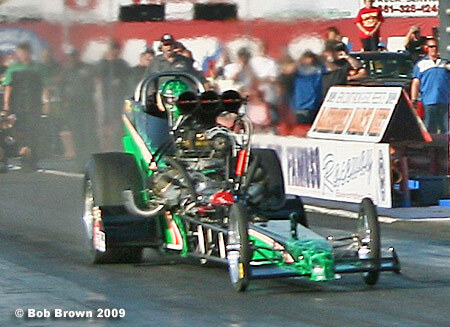 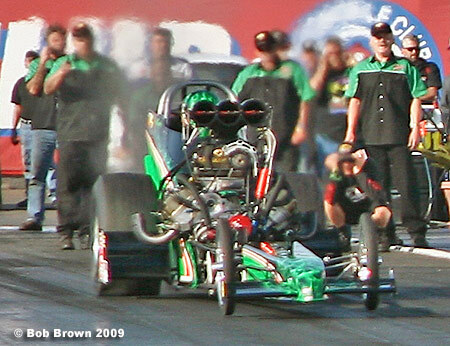 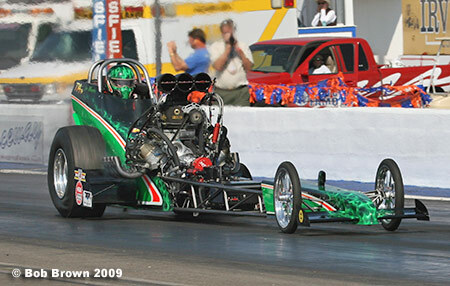 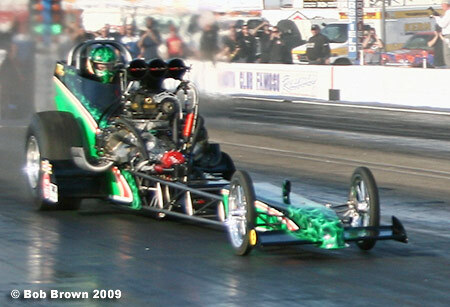 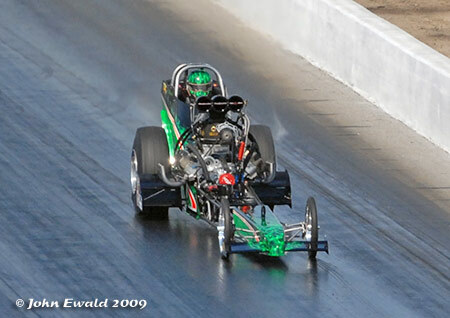 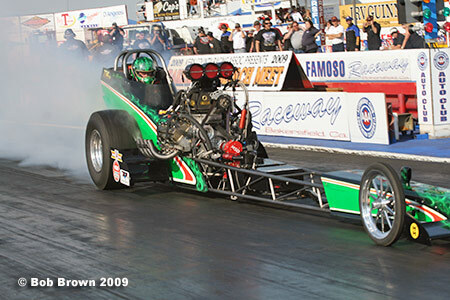 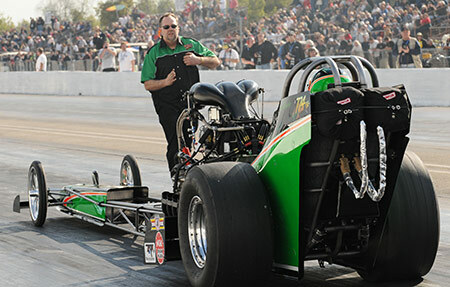 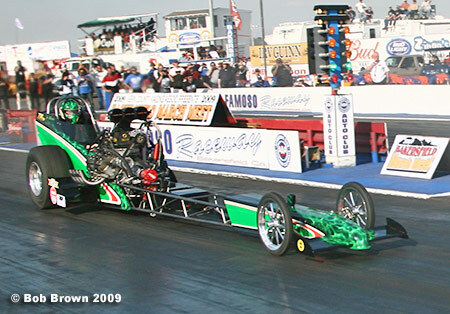 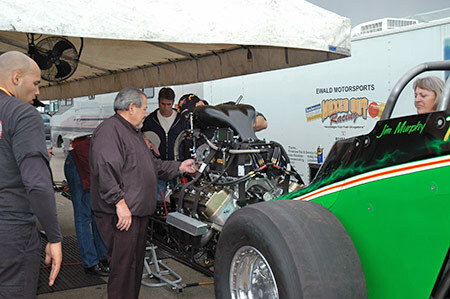 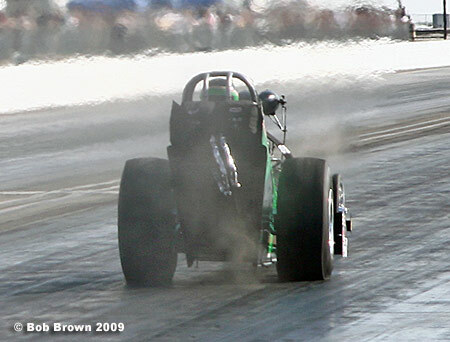 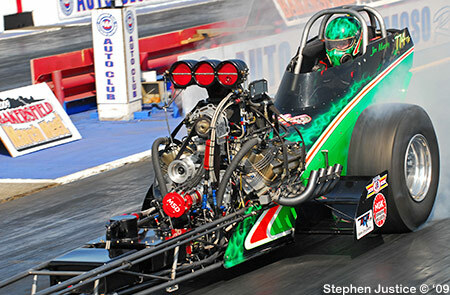 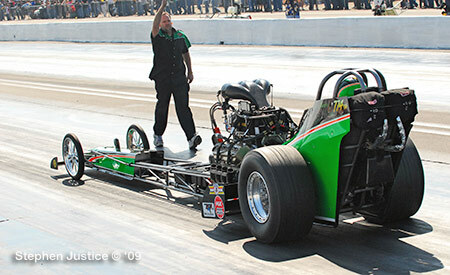 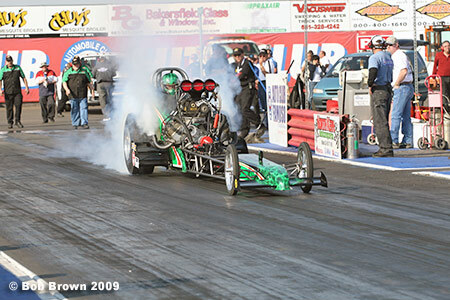 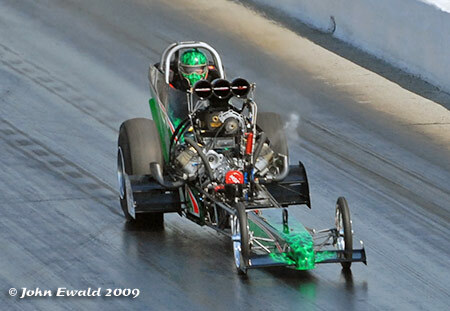 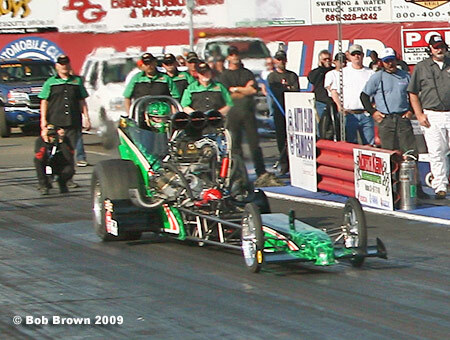 Murphy, who finished #2 in the 2008 NHRA Hot Rod Heritage Racing Series points race, was paired with the '08 champ, Troy Green. 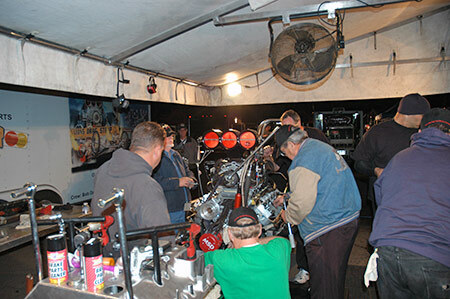 Crew Chief Tim Beebe made his final adjustments before sending Murphy to the staging beams. 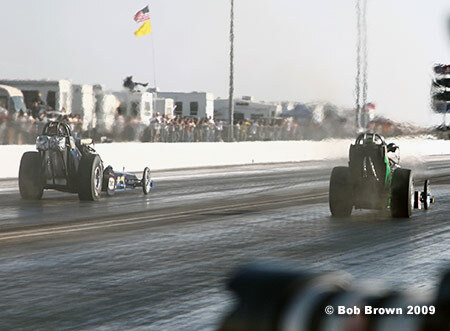 The car left hard and carded very good early numbers. 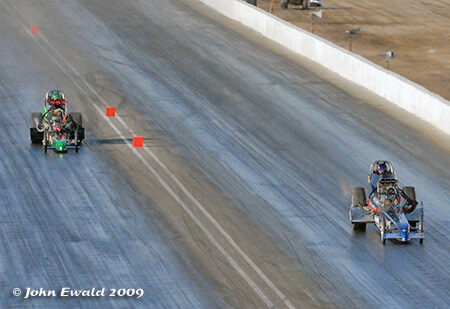 But by half track Murphy had over powered the cold track and started drifting toward the guardwall. 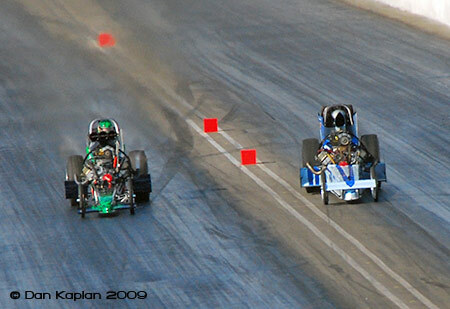 As can be seen in the following shots, the car got dangerously close to the wall and Murphy wisely clicked it then gingerly guided it back to safer ground. 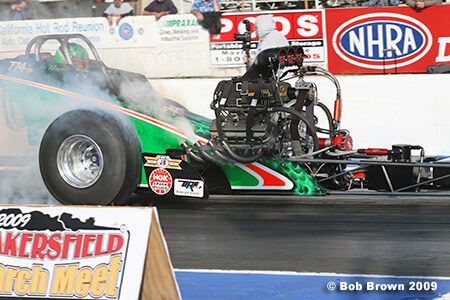 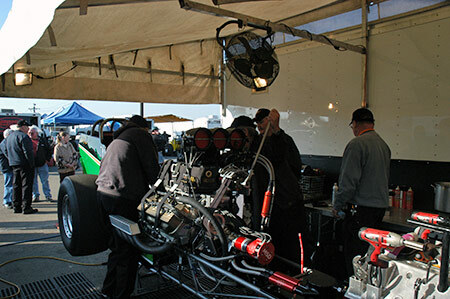 His 6.236 at just 178.71 reflects how good the car ran to half track and how early the run was aborted. 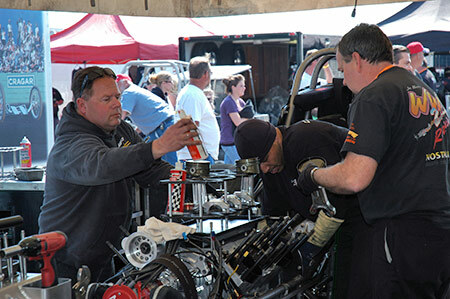 Knowing he had two more sessions on Saturday Murphy was not unhappy with the results. 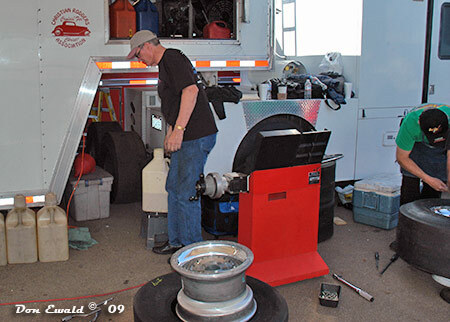 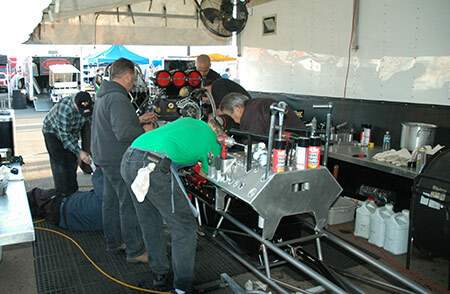 The crew did their standard maintenance to get ready for session two the next day. 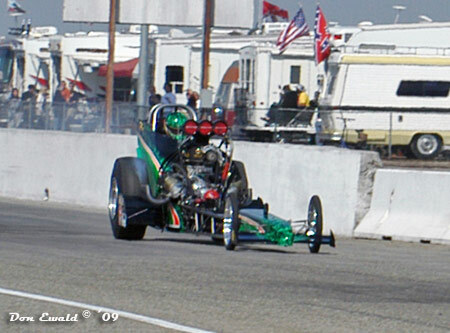 Saturday 2:12 p.m. 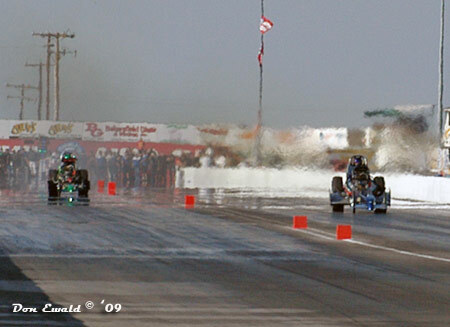 Weather conditions: air temperature 61 degrees, relative humidity 33 percent, barometer 30.12 inches, track temperature 92 degrees. 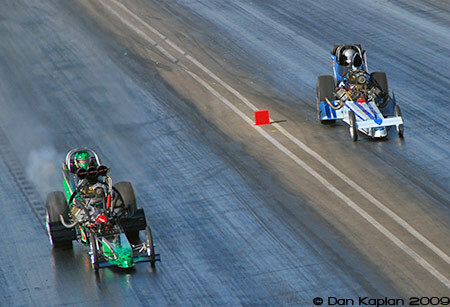 Overall conditions were much better than Friday. 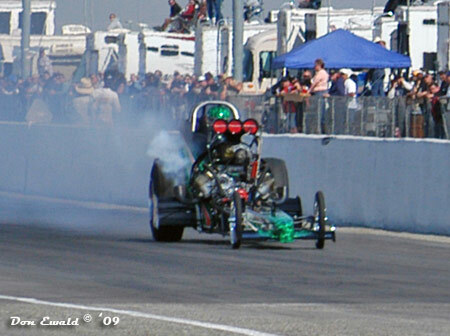 Michael Beebe lines Murphy up for his burnout. 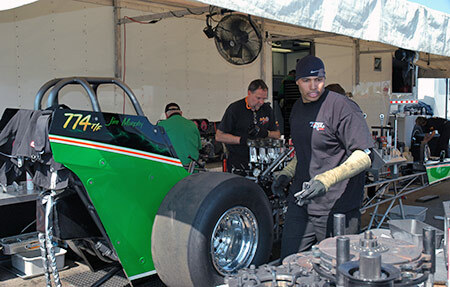 Paired with Mike McClennan, Murphy didn't have a super 60' time but picked it up big time down track. 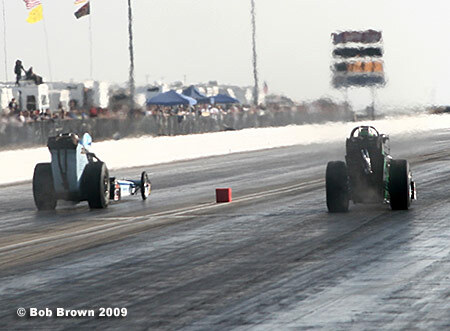 By half track McClennan was fighting to keep the car in his lane... but failed. 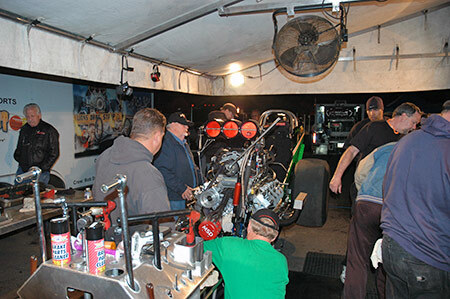 Murphy shut off a little early but still stopped the clocks with a very nice 5.767 at 240.77 which was good for the #2 spot at the time. 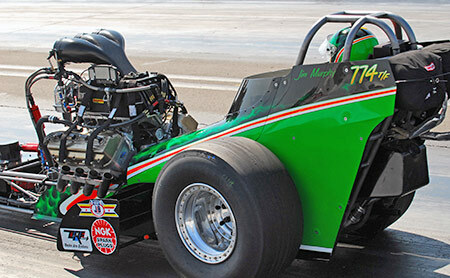 In fact, for several different reasons, Jim didn't drive the car under power past the 1100' mark all weekend. 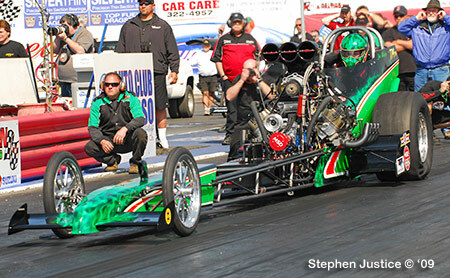 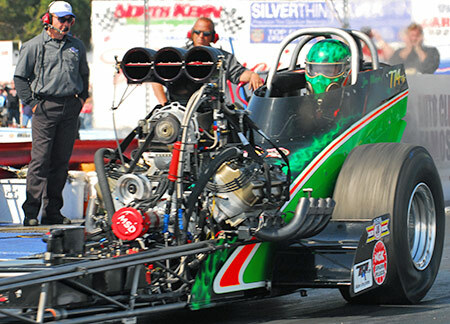 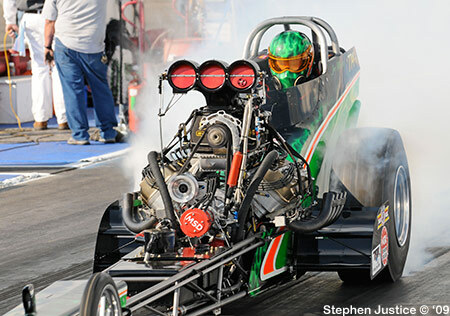 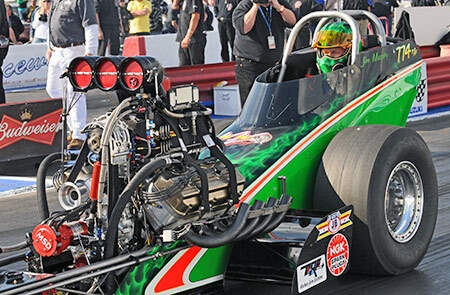 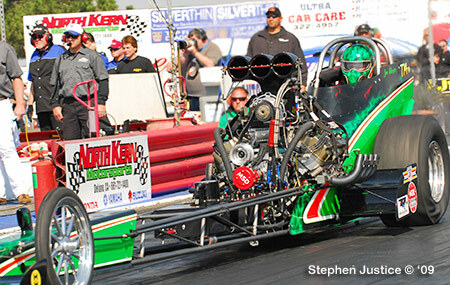 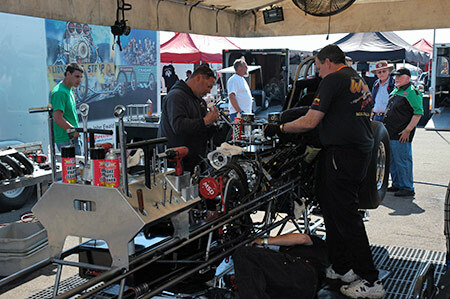 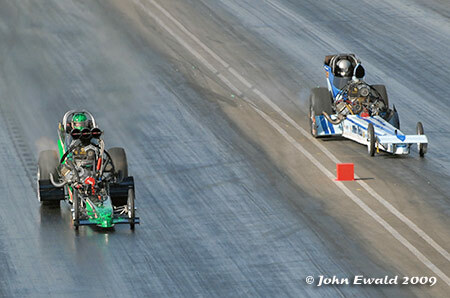 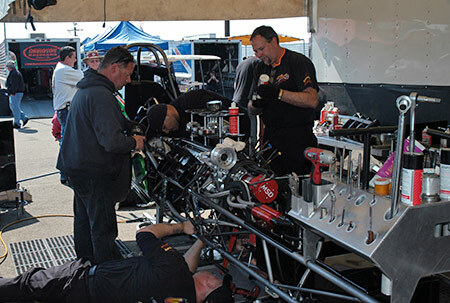 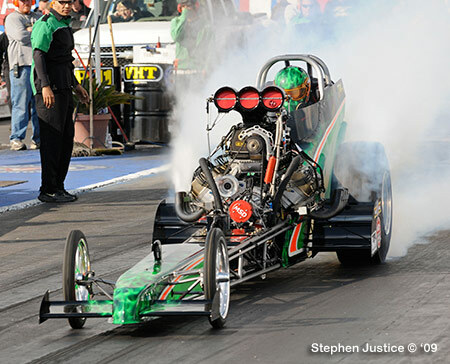 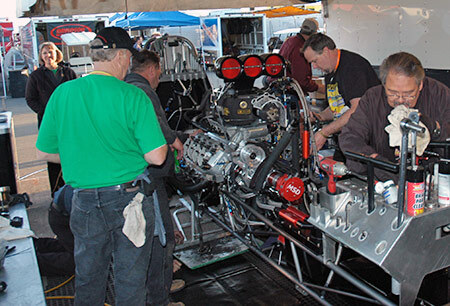 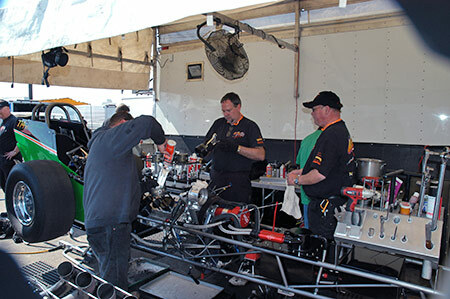 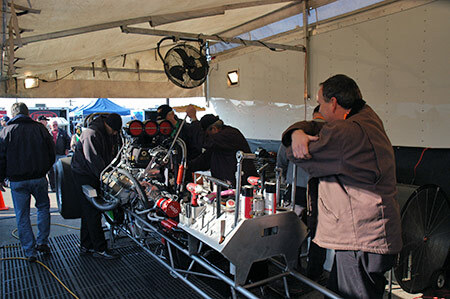 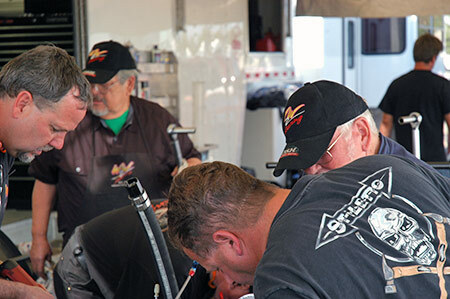 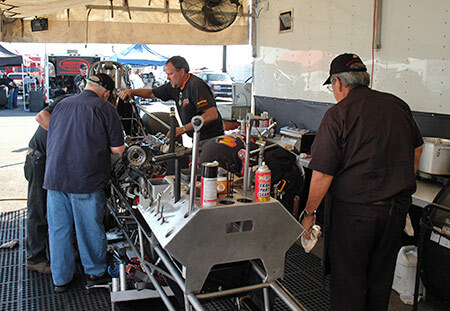 With their 5.76 still holding down the #3 spot, the team decided to pass on the last qualifying session Friday evening. 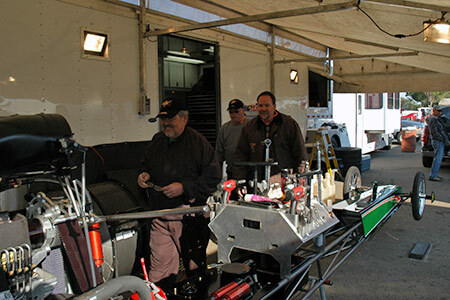 Taking their time, the crew got the car ready to do battle on Sunday. 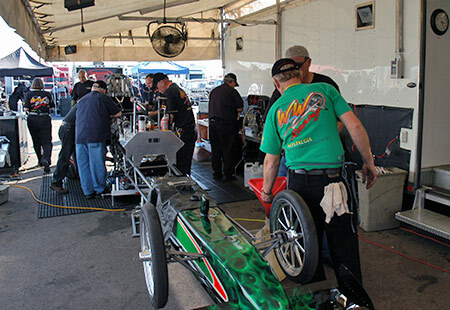 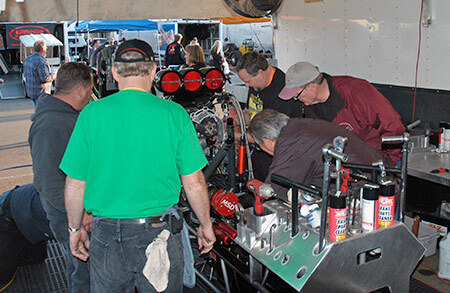 Sunday morning: With the first round of eliminations scheduled for 11:00 a.m. the car was out of the trailer early and warmed up by 9:30. 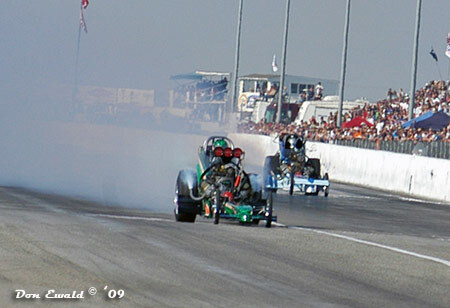 11:13 a.m. 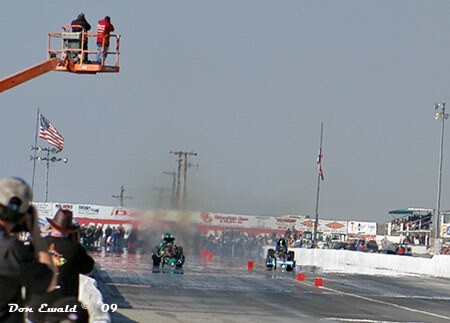 Weather conditions: air temperature 56 degrees, relative humidity 52 percent, barometer 30.06 inches, track temperature 75 degrees. 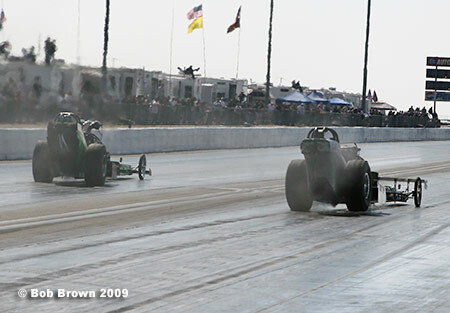 A lovely day for a drag race. 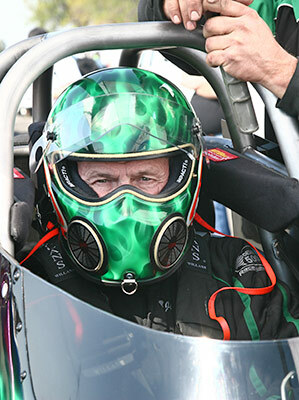 With his game face on, Murphy waited to fire up for his race with Rick Williamson. 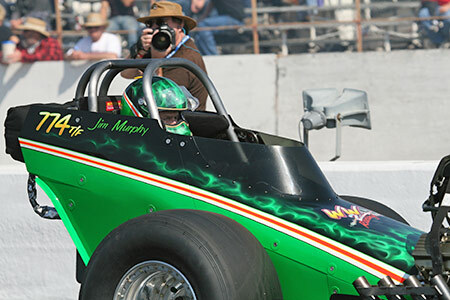 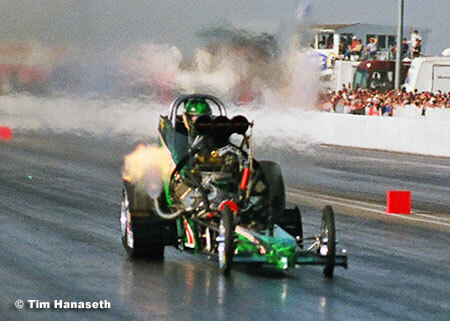 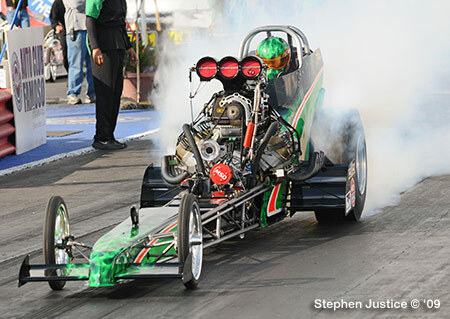 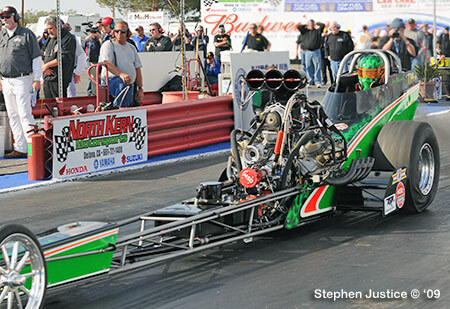 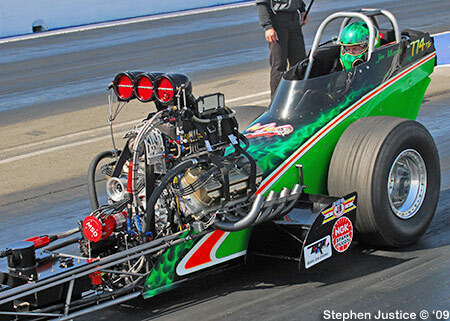 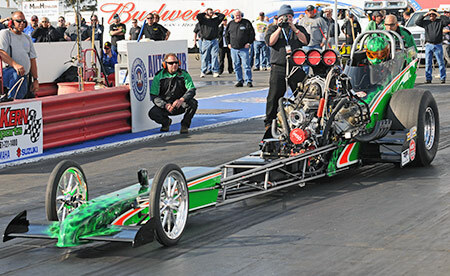 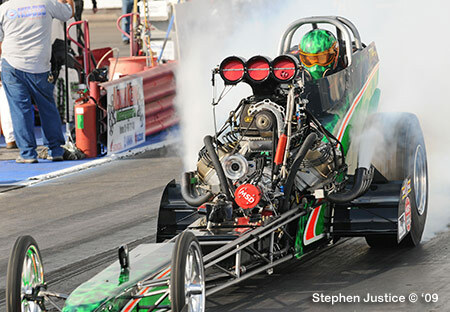 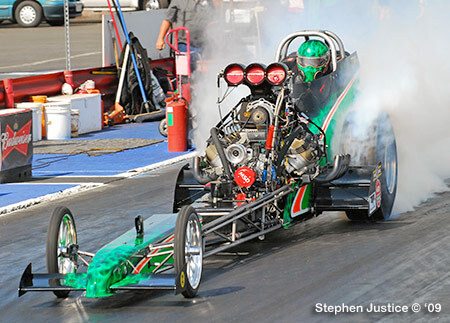 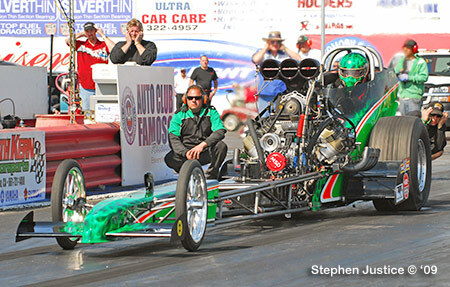 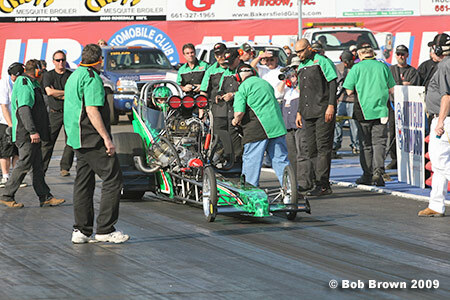 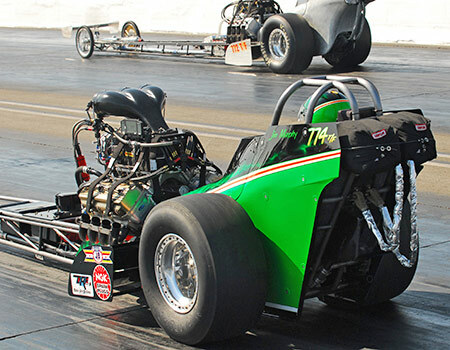 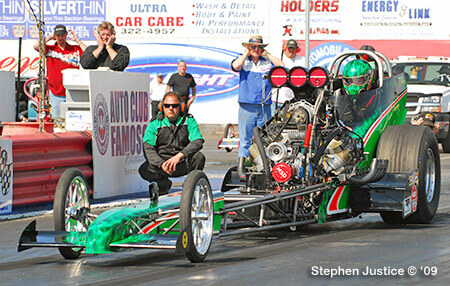 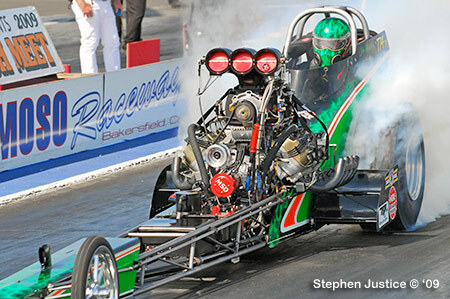 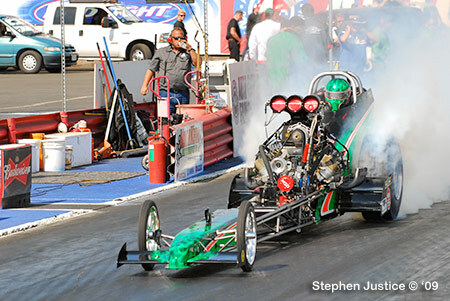 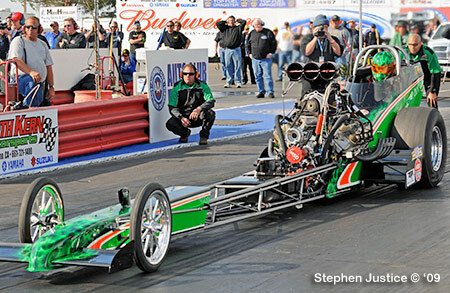 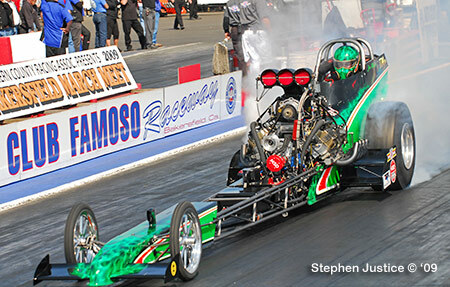 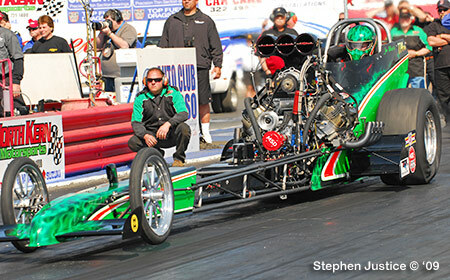 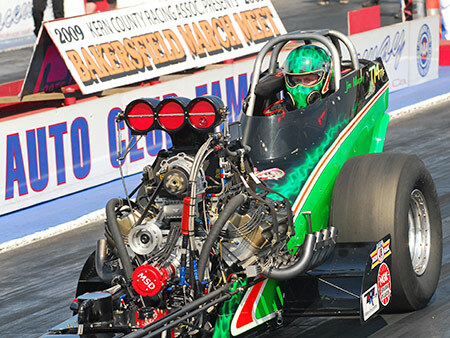 The green business coupe was ready... Murphy's incremental where 60ft-1.017 sec., 330ft-2.597, 660ft-3.810/205.10mph, 1,000ft-4.841. 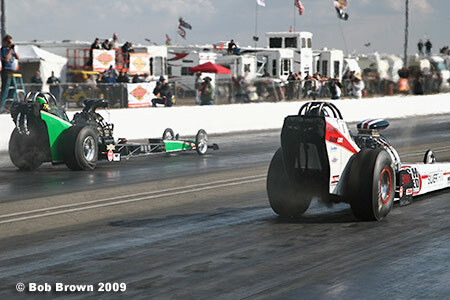 Williamson was in trouble early. 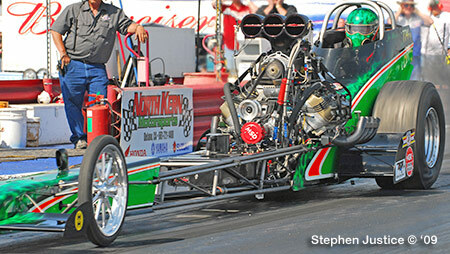 Shutting off early again, Murphy still clocked low ET of the round with a 5.768 at just 225.50. 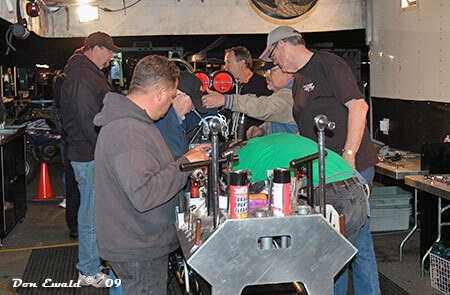 Between rounds it was all business in the WW2 pit. 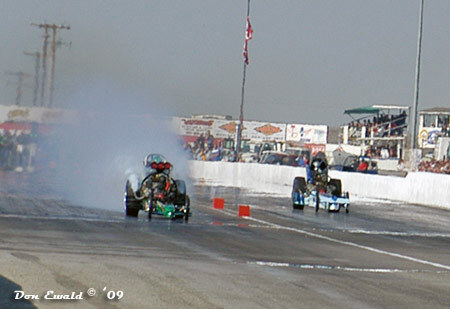 2:16 p.m. 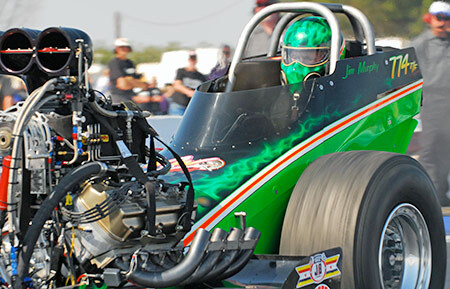 Weather conditions: air temperature 62 degrees, relative humidity 47 percent, barometer 32.06 inches, track temperature 81 degrees. 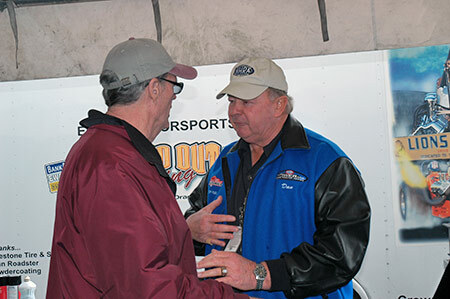 Murphy was scheduled to meet Brad Thompson in this round but Brad was a no show so Jim got the single. 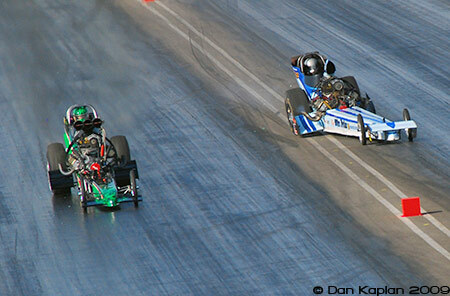 From the hit the early numbers were stellar again. 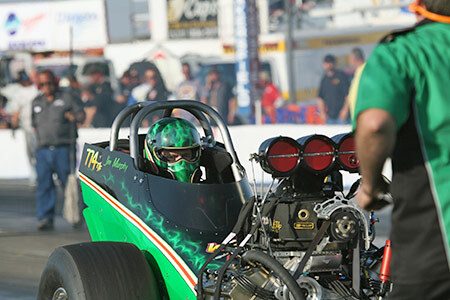 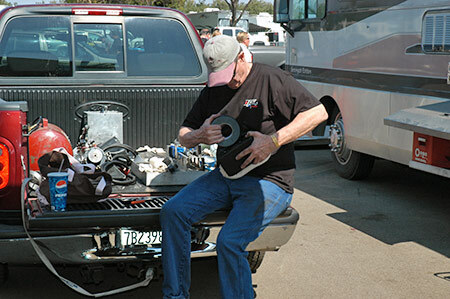 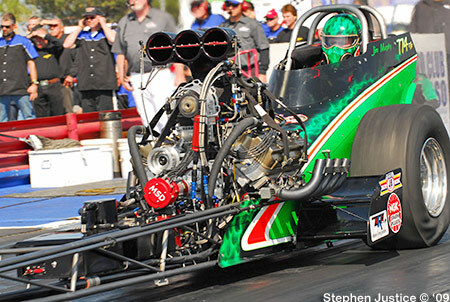 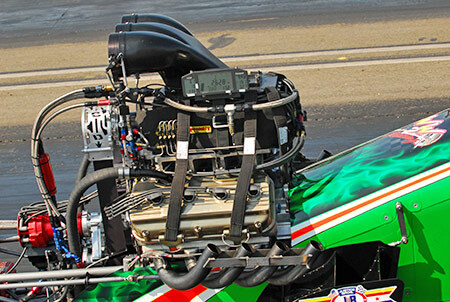 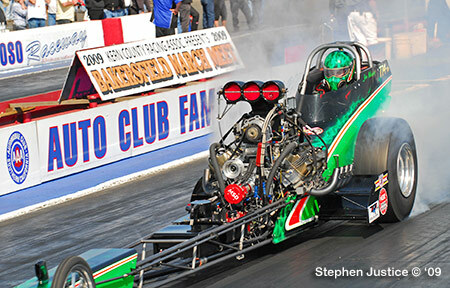 Murphy decided to save some parts and clicked it off early to a 5.960 at 209.64. 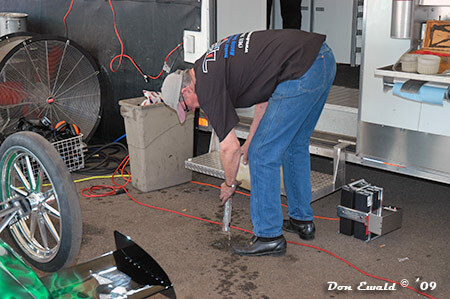 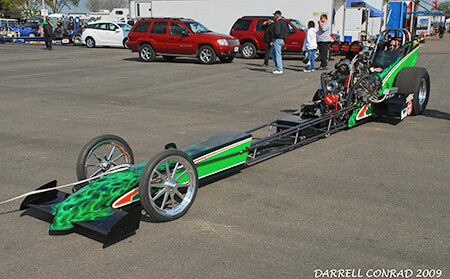 This may have proven costly as he lost lane choice in the semis against Rick White. 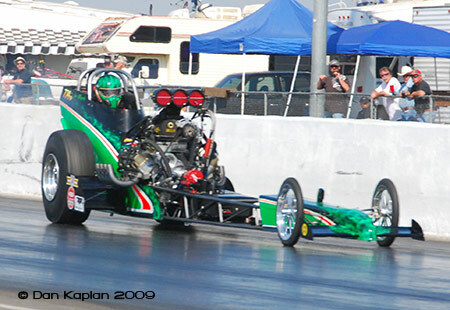 4:50 p.m. 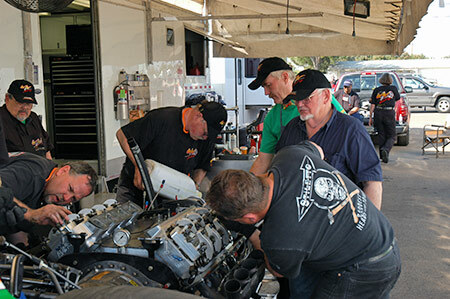 It was cooling off and Murphy was paired with Rick White who hadn't made a mistake all weekend. 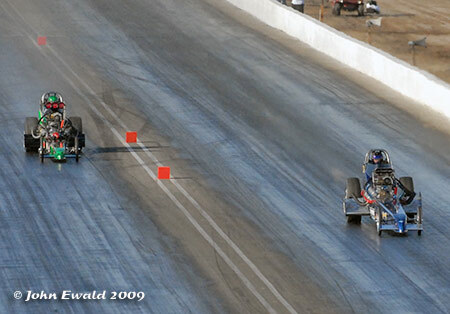 He was also in the least favored right lane. 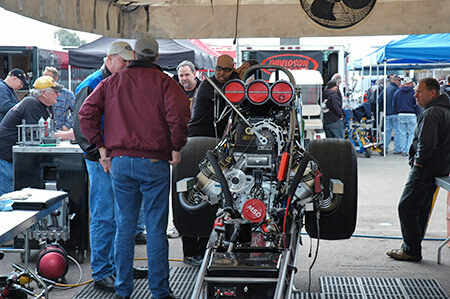 The early times were an indication this could be close but Murphy, with a very aggressive tune-up, drove through the clutch pretty early in the run and that was the weekend for his efforts. 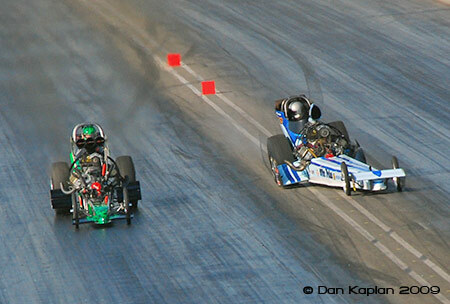 He clicked very early and White streaked away for the win. 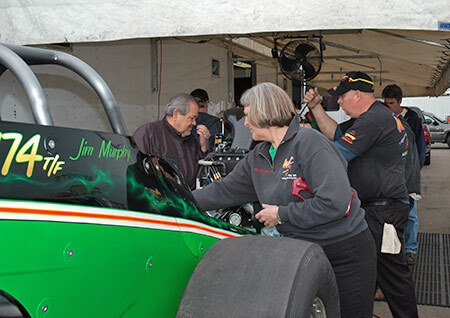 Another March Meet ends without a 5th win but you can bet Murphy and team will be back in 2010 to try again.